Don't get caught in a bad situation without being protected! 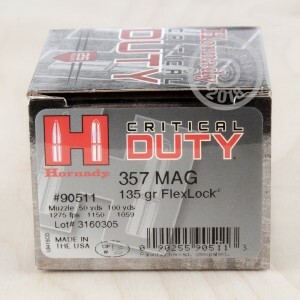 Hornady's 357 Mag Critical Duty ammo will give you the peace of mind you need that only a trusted leader in the ammunition industry can provide. 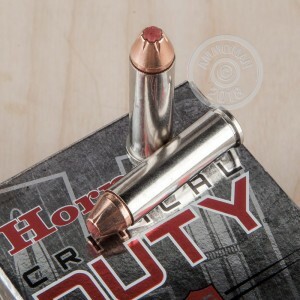 Hornady's Critical Duty line of ammunition meets FBI protocol standards for penetration and terminal performance through all common urban barriers. It is a top choice for law enforcement professionals, so you know it must be heavy duty enough for your own personal defense. The 135 grain JHP FlexLock bullet features Hornady's Flex Tip technology which is designed to prevent clogging and enhance barrier penetration. The interlocking band locks the core and jacket together to prevent loss of mass and energy during expansion. 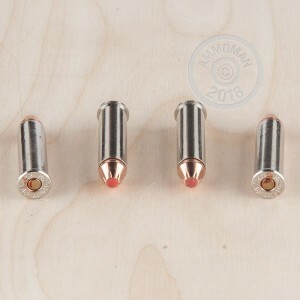 This product's reloadable 357 Mag cartridge has a nickel-plated brass casing and non-corrosive Boxer primer. It also features a low-flash propellant which will not hinder your vision. 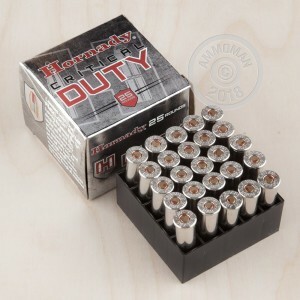 Hornady Manufacturing Company was founded in 1964. Today, the company is still going strong, providing law enforcement, hunters, and shooters with high quality ammunition. They are headquartered in Grand Island, Nebraska.